“What is this, it looks bad?” Is never a text you want to receive, no matter what it’s about, but it’s particularly concerning when it’s about something that will impact your children. But a few savvy PTA leaders sent that exact text to me when I was president of California State PTA in February 2016. They had been looking on the California Department of Education website for some information for their local legislation conference when they noticed an obscure button at the top of the website which said, “Objection to Student Disclosure.” After reading it, they immediately called and texted me. I took a quick look and contacted the California State PTA’s Executive Director, Sherry Griffith to do some more in-depth research. We discovered something very unsettling. Due to a federal district court ruling, the court could require information including the name, Social Security number, home address and more data on every student who attended public school in California since Jan. 1, 2008—more than 10 million students—be made available to a court-appointed data analyst so that it could be analyzed for a court case. Protecting the safety of children and their school records online, while ensuring access to high-quality digital educational opportunities, is critical in the 21st century. Meaningful education data can provide an immense array of benefits to students, parents and teachers. Accurate and accessible student data can assist teachers and families in creating more personalized learning plans to meet the needs of every child. However, no system is perfect, and California State PTA recognized the need for policies that ensure children’s identities are protected online, and families and students have reasonable control over the collection, storage and use of relevant personal education information. 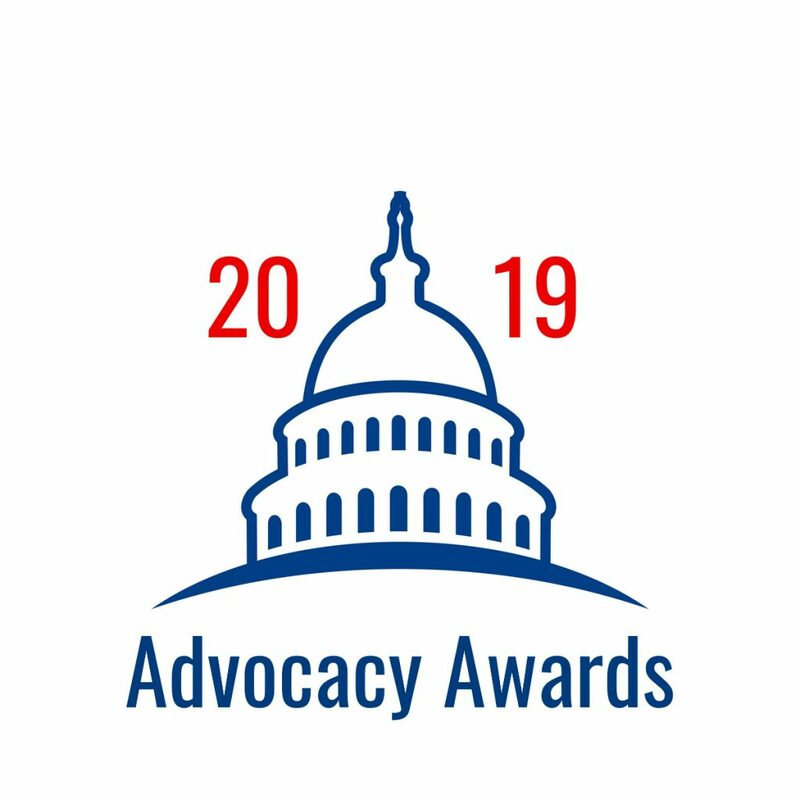 California State PTA has been an advocate of our children since our founding and we have always held a special focus on our most vulnerable children including those receiving special education services, foster and homeless youth and those struggling with poverty. With that, California State PTA had a long history of upholding the privacy rights of its state’s students. It was hard to fathom that a judge would allow such an overexposure of children’s private information. There wasn’t much time to get the word out to parents that their student not be included in this action—an opt out form had to be filled out, mailed and delivered by the April 1 deadline. California State PTA went into action. We got several key state-wide PTA leaders and staff together to come up with a plan. We would put the word out to encourage parents to opt their children out of the ruling. We sent an email alert, posted on social media, made phone calls, sent out press releases and took advantage of every communication channel directly to units with clear messaging. We knew that if enough parents took action, our message would be heard loud and clear. Our campaign was a success, with over a 90% email open rate. Fast and swift action by PTA members, leaders and other parents helped to spread the word far and wide as well. By April 1, the judge had received over 400,000 opt out requests, several letters, news and media coverage and pressure from other agencies to forgo the action and search for another alternative. Due to our quick action, communication and advocacy efforts, the judge chose another method for acquiring the information for the case without students’ personal data being used. California State PTA believes data, when used with student privacy in mind, can be transformational. Data collected for the California State School Dashboard and Support System and data collected for the California Longitudinal Pupil Achievement Data System (CALPADS) are just two examples of how data helps educators, schools, parents and communities strengthen learning opportunities and promote equity for children in California. 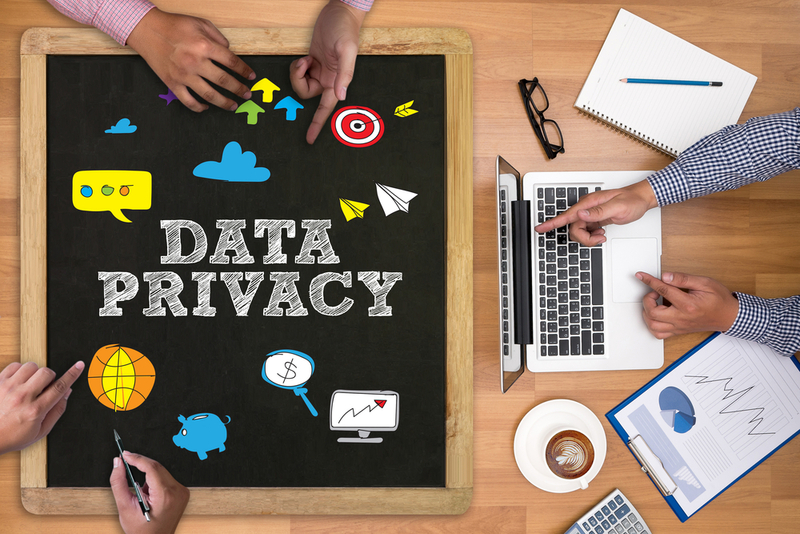 When we work to improve our places of learning with meaningful data while ensuring the privacy and safety of student information, students reap the benefits. Justine Fischer is the immediate past president of California State PTA. Do you want to step up your PTA’s involvement in school improvements or do you want to see the meaningful work your PTA and school is already doing recognized nationally? Have you ever wondered what it’s like to become a nationally-recognized PTA School of Excellence? 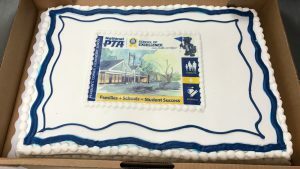 Here’s how one PTA took part in the program and celebrated their designation as a 2017-2019 National PTA School of Excellence. 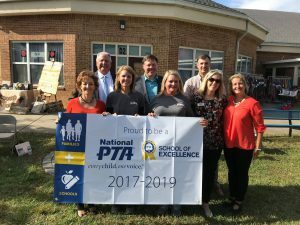 During the 2016-2017 school year, Pearson’s Corner Elementary School (PCES) PTA in Virginia committed themselves to improving family, school and community partnerships by enrolling in the School of Excellence program. After taking a Baseline Survey of their school community, PCES PTA created a plan to improve and implement effective engagement practices at their school—building off the Roadmap to Excellence they received from National PTA with recommendations customized to their survey responses and focus areas. Ashley Owen, PCES PTA President and School of Excellence Program Leader said, “the Roadmap to Excellence tool was an invaluable resource that our board was eager to reference to help shape our efforts.” Towards the end of the school year, PCES PTA administered a Final Survey to their school community to see if their hard work had made a difference. Upon submission and review of a Final Application, in August 2017, PCES PTA was designated as a 2017-2019 National PTA School of Excellence. This amazing PTA worked hard throughout the school year to improve their communication efforts. 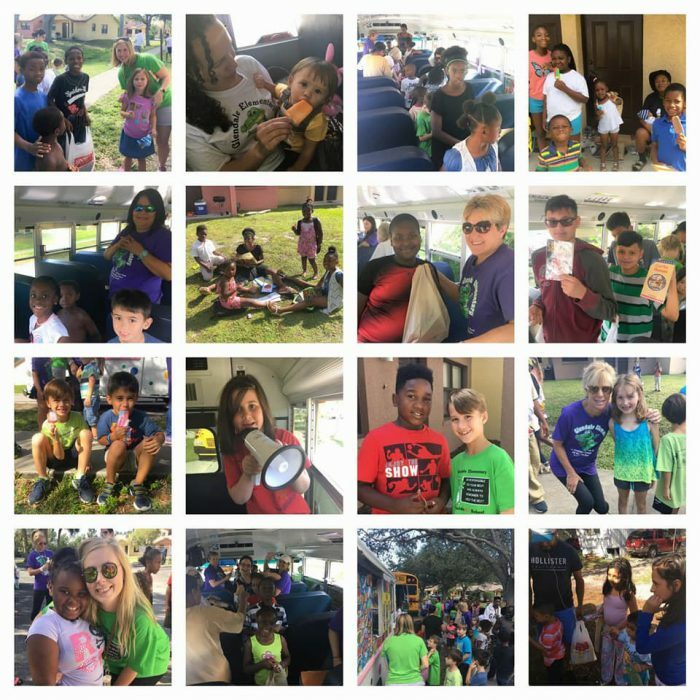 The PCES PTA disseminated information in a variety of ways, including a monthly newsletter, a trusted website and a popular Facebook page that was updated several times each day with friendly greetings. 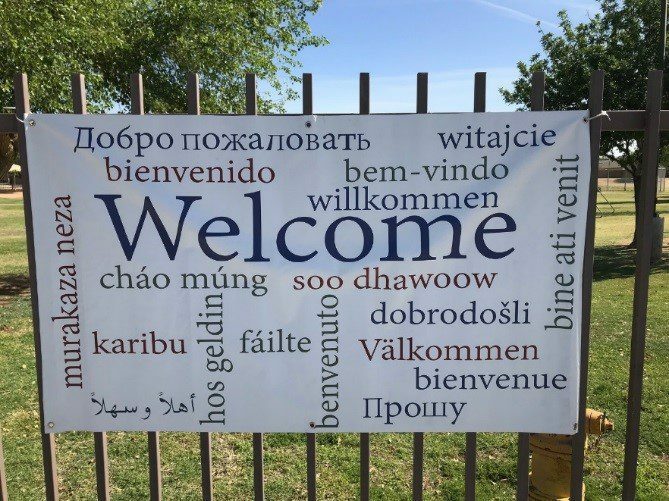 They also had a PTA bulletin board, posted information on the school marquee, sent information using the school’s email blast system, sent PTA information in student folders and sent information in the mail. 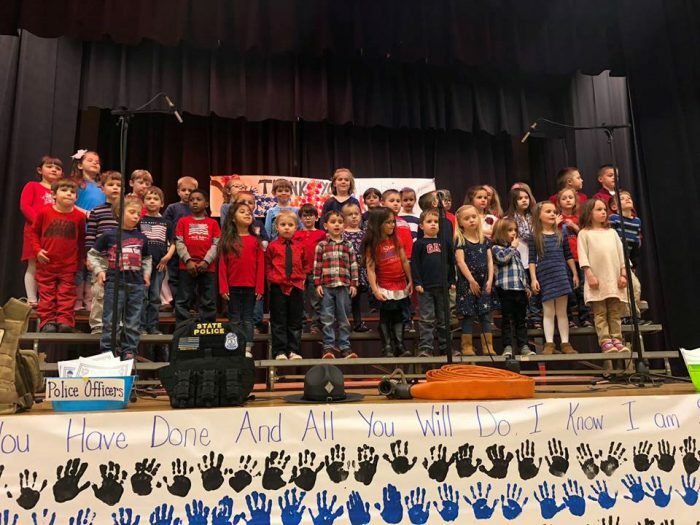 Their easy-to-navigate PTA website looked professional and acted as a clearinghouse of information seen as a reliable and trusted a source of information. 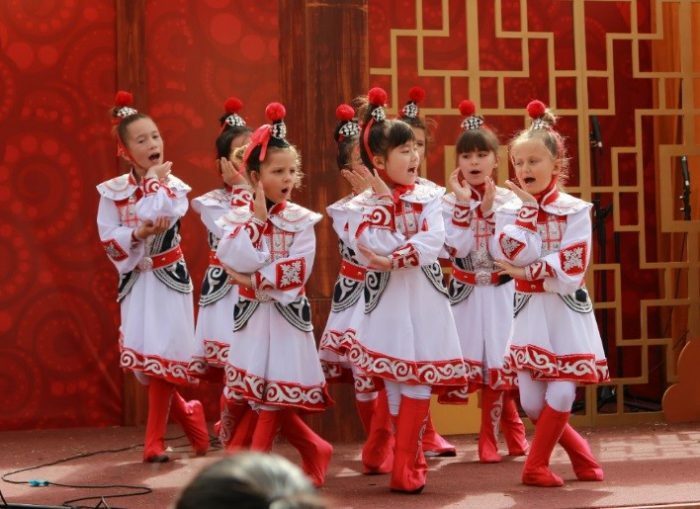 Furthermore, a PTA newsletter was used to communicate upcoming events and news. It was distributed through email, posted on the website and publicized on Facebook. Congratulations, Pearson’s Corner Elementary School PTA and thank you for sharing your story with us! 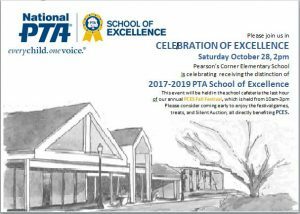 You too can join the ranks of over 600 PTAs across the nation in becoming a designated National PTA School of Excellence. By enrolling, your PTA will identify and implement an action plan toward school improvement while attracting new, action-oriented members who want to focus on issues that affect our children the most. And being a National PTA School of Excellence will open the door to other opportunities and honors for your school. 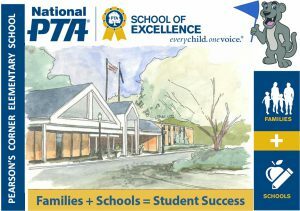 To enroll in the School of Excellence program, visit PTA.org/Excellence or email Excellence@PTA.org with any questions. Amy Weinberg, MA is the Manager of Programs & Partnerships at National PTA and serves as the primary contact for the 2018-2019 School of Excellence program. March is National Nutrition Month and one of my jobs as a parent is to make sure my children are eating healthy, nutritious foods. However, I have to hope that they are making those same healthy choices in my absence while they are at school. The school week leaves a lot of time for friends to offer unhealthy snacks that they’ve brought from home and for one too many cupcakes during birthday celebrations in class. So, how do we teach our children to choose healthy food alternatives? 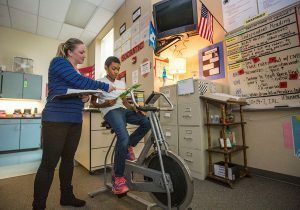 As a PTA president for the last four years, I’ve spent a lot of time in our school and began to see the positive impact being made on healthy initiatives for students. 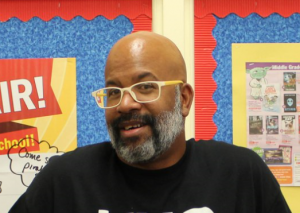 I knew that I wanted to be more involved in this effort, so when our PTA had the opportunity to apply for a Healthy Meals Grant we jumped at the chance…and were selected! Our goal for the year is to increase breakfast and lunch participation by 10%, which sounds great on paper but where do you start? The answer: Empowerment. We start by partnering with the school and meal services provider to help show children what it means to eat healthy by putting the right choices in their hands. I know that I’ve had those mornings of waking up late and rushing around, hurrying my children to the bus stop with a Pop-Tart. 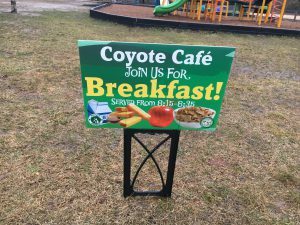 We asked ourselves: Do students and parents even know that breakfast is available at school? Colorful signs that depicted healthy options were put up at the parent drop off loop to inform families about school breakfast. 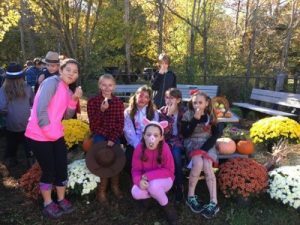 During our Fall Festival Celebration we had an apple tasting contest. It was our chance to highlight the health benefits of apples while having a fun learning experience. Students were given samples of three types of apples: Gala, Granny Smith and Golden Delicious. Student were then asked to choose which apple they liked best by placing representative felt apple on the board. The apple tasting continued in the lunchroom for the younger grades with Golden Delicious edging out the others by a slim margin! What better way to highlight our school’s breakfast and lunch options than to have students share updates with each other. 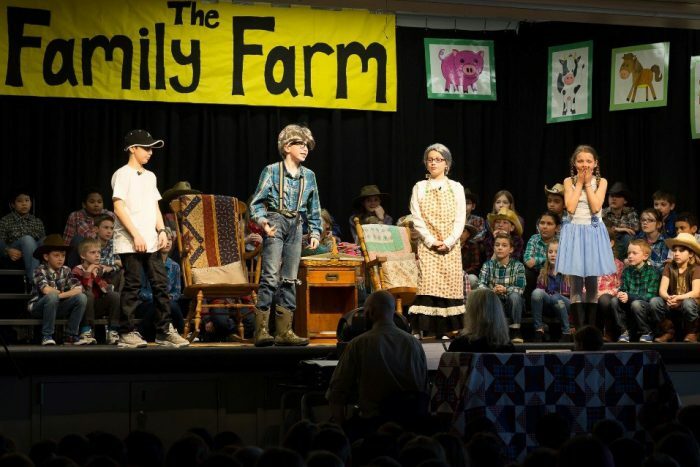 Each morning the Mullica Morning Howl – student led video announcements – were shown to the entire student body at Mullica Township School. During this time, students were able to speak about what breakfast and lunch options were available each day. Jessica Carroll is a parent of two boys and PTA president of Mullica Township School in Elwood, New Jersey. Last month, Illinois PTA President Matthew Rodriguez was recognized with an honorary “Father of the Year” award by the Illinois Fatherhood Initiative (IFI) at its 19th Anniversary Fatherhood Dinner Celebration. The IFI is a statewide nonprofit organization whose mission is to foster loving and caring father-figure relationships in the community and actively engage fathers in the education of children. Notable members of the IFI include President Barrack Obama, Illinois Senator Richard J. Durbin and Chicago Mayor Rahm Emanuel. Each June, the IFI hosts the Fatherhood Dinner Celebration to honor prominent dads for being positive male role models for their own and all children in their community. Rodriguez was selected to receive the Father of the Year award by IFI CEO David Hirsch for his dedication to making a difference in the lives of all children. This is not the first accolade Rodriguez has received. Last fall, he was honored with the Illinois Legislative Latino Caucus Foundation’s (ILLCF) Service Award. Rodriguez was among four recipients chosen by the ILLCF Board to receive the award for his significant contributions to the Latino community in Illinois and his important work as the first Hispanic male president of Illinois PTA. 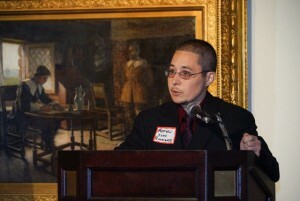 As president of Illinois PTA, Rodriguez has been committed to increasing male engagement in schools and communities. Research shows that some 24 million children—1.1 million in Illinois alone—are growing up today in homes without fathers, which adversely affects children, families and communities. Children who do not have a father or male figure in their lives look up to male role models in their schools. And when men are present in schools, student achievement increases and negative behavior decreases. Among his other efforts, Rodriguez recently participated in the 21st Century Dads Honor Ride 2016, a cycling campaign to raise awareness and resources for fatherhood charities. The purpose of the ride is to highlight the importance of dads in their children’s lives, create greater awareness of the father absence crisis and raise necessary funds for fatherhood organizations to support ongoing efforts to combat fatherlessness. As part of the ride, participants visited police stations, fire stations and other locations in communities to honor dads and thank them for being present in their children’s lives. Olivia Kimmel is the PR and social media intern at National PTA. This past spring, millions of students across the country took the PARCC (Partnership for Assessment of Readiness for College and Careers) assessments in English language arts/literacy and mathematics for the first time. Parents are now receiving their children’s scores from the tests. Since these are new tests and assess skills like critical-thinking and problem-solving, the score reports may look different from reports provided to families from previous tests. As part of its ongoing commitment to help families navigate the changes taking place in classrooms, Maryland PTA collaborated with the Maryland State Department of Education to conduct webinars and in-person programs for parents across the state to answer their questions on the new assessments, help them interpret their children’s scores on the tests and empower them with tools and resources to support their children’s success. The information sessions also were designed to help parents work together with their children’s teachers and administrators to fill gaps in learning as determined from the PARCC results to ensure children graduate prepared for college and careers. 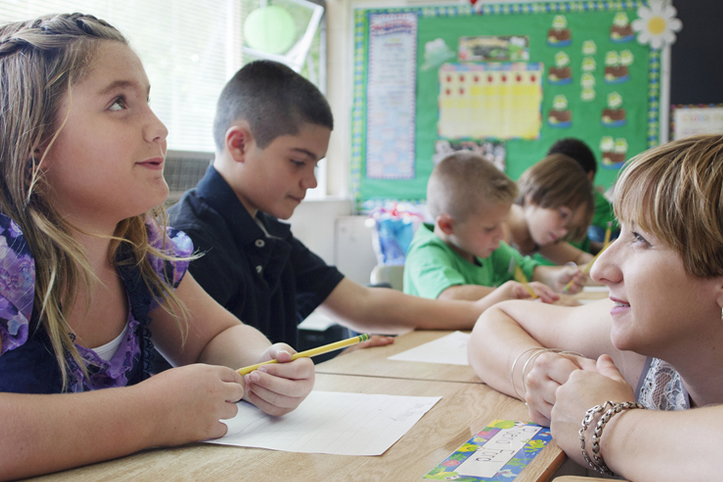 The PARCC tests measure the extent to which students are learning the knowledge and skills they need to progress in their K-12 education and beyond. The new score reports are designed to be actionable and be tools for parents to understand where their child is doing well and where there may be a need for additional support. This information, along with grades, teacher feedback and scores on other tests, will help give parents a more complete picture of how well their child is performing academically. As part of the information sessions, Maryland PTA utilized BeALearningHero.org and Understandthescore.org. BeALearningHero.org features a search engine where parents can find tools and resources—in English and Spanish—specific to their child’s needs­. 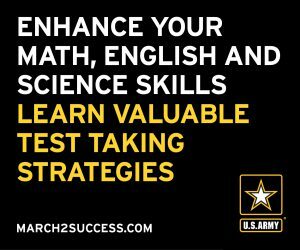 UnderstandTheScore.org includes a Score Report Guide to help parents identify the key factors that determine their child’s performance on the PARCC test, as well as his/her academic gaps and strengths in English language arts/literacy and mathematics. Once parents pinpoint their child’s strengths or needs, they can connect to resources, tools and activities that support their child’s achievement. We know every parent wants the best for their children and wants to support their learning in the most effective ways. Maryland PTA will continue to deliver regularly-updated, timely information to help parents feel confident and informed. Parents can visit www.MDpta.org to learn more about the PARCC results and to receive regular updates with tools, tips and resources. Elizabeth Ysla Leight is the president at Maryland PTA. Now, what does passion mean to you? We are all busy and have mastered the art of doing enough to get by. For instance, I throw a frozen pizza in the oven and call it “dinner,” instead of making the dough fresh, tossing that homemade dough in the air, crushing homegrown tomatoes into a rich pizza sauce; arranging the ingredients on the pizza in a way that will allow each hungry diner a perfect bite—why? Because I don’t have a passion for it. So why do we do the things we do? We take on tasks, jobs and projects for these reasons all the time. Sure we will probably fulfill our obligations, but we may dread doing it again—and probably won’t do it again—because we aren’t doing it for the right reason—PASSION. Years ago when I joined PTA, we were 6 million members strong, but now membership has been steadily declining. I wonder why this is. Moms and dads still are concerned about their children’s education. We know how vital it is to engage with our children’s teachers. Surely we want to be involved in decisions that will not just impact our own children, but the lives of children long into the future. For years, I had to explain why I was so heavily involved with PTA. The answer was always easy, because PTA gave me so much more than I ever gave PTA. My parents were not involved in my school activities, which made me decide I wanted more for my own kids. PTA taught me lessons that I may have never learned anywhere else. It made me a much stronger mother, a more confident leader and without being too melodramatic—a better person. When I first joined PTA, I quickly found out that I wholeheartedly believed in its principles and understood why people cared so deeply about it. I still believe in PTA today. I believe that we must continue to fight and advocate for children, because if we don’t, who will? I was really moved by a workshop that Sherry—our Montana PTA president—presented, called the “History of PTA.” She shared the obstacles that early members encountered; blizzards with 10 feet high snow drifts, traveling across the country by train to go to meetings. They were fighting for such important causes: child labor, vaccinations for children, feeding them hot and healthy lunches while they were at school, the list goes on and on. So many of these things we take for granted, because these strong industrious women had a notion (or you could say a passion) that we could do better for our children. I am so thankful for the time that I spent knee deep in the trenches for PTA. 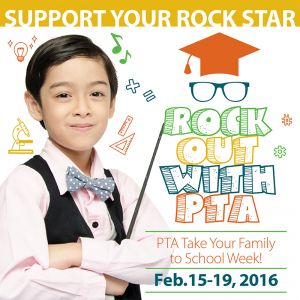 I look around at my PTA family, my friends, friends that I have made because of PTA. 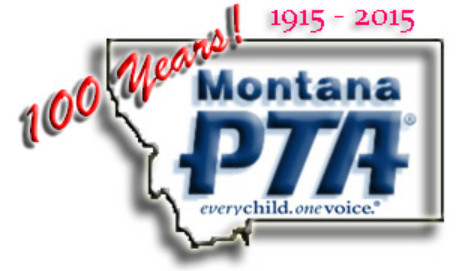 And I am most grateful to be a part of the past of Montana PTA, and I implore all of you to be the brightest future! Around my 40th Birthday I began a quest to live a bigger, better life, and with that idea I came up with a personal mantra that I think is relevant here today: “Status quo has to go.” We can no longer accept that someone else will step up; we must be the ones. We cannot accept our little comfort zones we have made for ourselves, we must break out. Please think BIG for yourselves and for PTA. Don’t limit yourselves. Your potential is beyond measure. Thank you all for coming and Happy Birthday Montana PTA! Danielle Kopp is a member of Montana PTA. She gave this speech at the 2015 Montana PTA Convention.